Please note that this event will take place at its scheduled time of 2pm today, Thursday, February 28. Rhoda Maurer is Plant Growth Facilities Manager for the Cornell University Agricultural Experiment Station, which is dedicated to sustainable science for life and hosts more than 400 research, teaching and outreach projects year round. 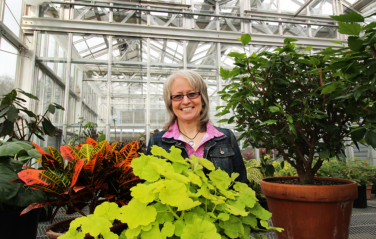 She served as Director of Horticulture for Cornell Botanic Gardens, where she was responsible for curating more than 40,000 plants representing across 450 acres of arboretum and botanic gardens and setting a vision for the program with an eye towards conservation and sustainability. Previous posts included managing the research greenhouses at the New York State Agricultural Experiment Station in Geneva, NY and serving as the Assistant Curator at the Scott Arboretum of Swarthmore College in Pennsylvania. She has trained at The Elisabeth C. Miller Botanical Garden in Washington and the Royal Horticulture Society’s Garden at Wisley in the United Kingdom. She recently completed a Masters of Arts in Science in a Changing World from the University of Massachusetts at Boston, inspired by a desire to scaffold an appreciation of how horticulture, art, and awareness of our environment add value to people’s lives across cultures and disciplines of study. Maurer recently sat down with the Garden’s Training Center Director, Kristin Faurest, to speak more about her work. Find the interview, here. The Garden+ lecture series places the Japanese garden in bold and inspiring new contexts by bringing designers, authors, practitioners, and researchers to the Garden to share fresh ideas. Come experience original perspectives, thought-provoking research, and new creative work. We bring presenters from around the globe to shed new light on how gardens connect to subjects as diverse as spirituality, technical innovation, architecture, culture, design, and society — all made more resonant with the Garden itself as a backdrop. Garden+ is a presentation of the International Japanese Garden Training Center, which is supported by the Japan Foundation Center for Global Partnership.